국외 2년 봉사 활동이 국외 취업? 지난 12월 13일 [귀국단원 해단식 및 한국해외봉사단원의 밤]에 참석을 했다. 한국에 파견되었던, 지금은 할아버지가 된 한 미국 평화봉사단원도 초청 인사로 참석했다. 그가 연설을 통해 한 얘기 중 흥미로운 것은, 평화 봉사단이 도움을 준 나라 중 한국만이 유일하게 봉사단 프로그램을 포함한 원조를 하고 있다는 것이었다. 원조받던 나라가 원조하는 나라가 되었으니 자랑스러운 일이다. 행사 중간에 묵념 시간이 있었다. 활동 기간 중 사망한 단원들의 이름이 불리고 나서 참석자들은 그들의 혼과 넋을 달랬다. 내가 활동했던 시기였던 1999년 전후에는 활동 중 사망이라는 상황은 거의 상상할 수 없었다. 부족한 점은 있었지만, 신변 안전과 보건 위생에서 만족할 만했기 때문이다. 봉사단 파견 인원 확대를 통한 청년 실업 해소를 위한 정책이 구체화 되고 있다. 논란은 있었지만 얼마 전에도 봉사단 사업 확대가 결국은 이루어졌다. 봉사단 사업 자체의 질적 향상 없이 파견 단원만 늘었다는 비판이 지금까지 늘 제기되어 왔다. (파견 단원 통계 참조) 이런 마당에 파견 단원을 더욱 늘리겠다? 미래는 아무도 모른다. 하지만, 현 봉사단 사업 체계와 결합한 취업난 극복 사업전략에는 문제가 많다는 주장이 귀국 단원 내부에서 꾸준히 나오고 있다. 사망, 보건 위생, 질병과 같은 (풍토병, 상해, 정신 질환 등) 신변 안전 문제가 그 중심에 있다. 당근 그들은 완벽하다고 주장 중이다. 현 상황에 대해서는 관련 자료 아래 참고하시라! At the same place, nine years ago! Uploaded by jangmimadokoro, these two videos show how atmosphere of local language instruction prepared by Korea International Cooperation Agency (KOICA) is. The class is for called Korea Overseas Volunteers (KOV) passed intensive screening in language and specialization. 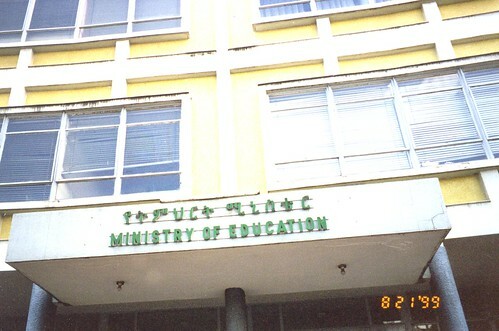 I attended an Amharic course at the same place, nine years ago! Korea Overseas Volunteers Association (KOVA) hosted year end party, named, evening of Korea Overseas Volunteer (KOV) last Saturday. It is an annual event to welcome successors returned back to Korea this season from overseas where they served as a KOV. Predecessors join together to speak high of their sacrifice as well as to congratulate on safe return with invaluable experience accumulated during their voluntary operations. In this way, the party can give us a great chance to understand diversified cultures one another simply by saying which county they were dispatched to, what they did as a volunteer, how they survived harsh living condition, whoever they collaborated with, and more. Of course, everybody could feel great joy from the party. In addition to that happiness generated from an ordinary party organization, regional music performances triggered the rise of homesickness to attendance. African music performance out of them (I could not get the synopsis of the dance, the origin of the song, and the theme as a whole, however) aroused remembrance in Ethiopia. Regardless of my feeling based on affinity with African continent, everybody could be absorbed in dynamic and powerful rhythm from the performance. The more exposed to another culture like this, we can expand our life view wider. It's one of virtues of diversity! Recollecting what I had done as a Korea Overseas Volunteer (KOV) in Ethiopia, I still wonder what the true volunteerism is. I redefined my volunteerism into "technical cooperation" in the article from KOV category of this blog because spiritual understanding in grass root level was missing. Specifically speaking, I was always busy in preparation of network with cutting edge technology, training materials, reports to the Ministry and KOICA regional office, and any other tangible matters only. At the end of stay in Ethiopia, only thing that I could do was just to keep unforgettable memory with Ethiopian around my residence. If I revisit Ethiopia as a volunteer, I will be able to behave in different way by devoting myself to understanding existing Ethiopian cultures as they are now. However, will my revisit happen? Of course, not! Whenever I read articles from "One Love Theater/Blog", I can imagine what and how the volunteers there are doing in Awassa with the spirits that I should have shared with colleagues from the Ministry of Education in Ethiopia. Look up article from this link! The word "volunteer" from Korea Overseas Volunteer, itself, implies sacrifice innately. When it comes to engineering, my volunteering should be considered as technical cooperation, I think. Enumerating what I did at that time, I repeated introducing new technology, persuading its implementation, making MOE staffs understood from training, following up progress, and discussing issues to escape from stalemate that most of KOVs were prone to encounter in the middle of cooperation. That's it! Interacting with local staffs was the very virtue of volunteerism.